In our series on the classic photographs of the Loch Ness Monster we move onto the famous picture taken by Lachlan Stuart in 1951. At that time, things were pretty quiet at Loch Ness. Sightings of the creature still continued but these were the years of post-war austerity and rebuilding, so it seems that the Loch Ness Monster was not high up on the list of newsworthy items. Indeed, the last photograph of note prior to Lachlan Stuart appears to have been the one taken by F.C. Adams 17 years before in August 1934. Despite the alleged ease with which supposed fake photographs can be made, this seemed a long time to wait for the next one. Either way, this photograph exploded onto the scene on the 16th July 1951 via the pages of the Sunday Express. The incident had happened the day before and Constance Whyte in her book "More Than a Legend" recounts the tale which we summarise here. On that Saturday, Lachlan Stuart had arisen at about 6:30am to milk his cow on the croft he and his family occupied about 100 feet above Loch Ness at Whitefield which is almost opposite Urquhart Castle. He glanced out at the loch and noticed what he took to be a motor boat heading north up the centre of the loch. However, on further inspection, the object looked more rounded and when a second hump appeared behind it Stuart called to his wife and fellow woodsman Taylor Hay. By the time Hay and Stuart had scrambled through the trees to the shore, the object was now displaying a third hump and had changed direction moving quickly southwards about 50 yards from them. Stuart readied his box camera, saw the three humps in the viewfinder and took a picture. The creature was now moving towards a small promontory further south and a long neck and head had by then surfaced which was generally held parallel to the surface whilst intermittently submerging. The head was described as sheep like but without the ears. The small black dot in front of the left most hump in the photo is said to be the almost submerged head. At one point the creature was close enough to shore to make the witnesses cautiously head back into the trees but the monster eventually headed back to the centre of the loch where it finally submerged head first about 300 yards out. Stuart estimated each hump was about 5 feet long at the surface line with about 8 feet of water between them. The first hump stood about 2 feet out of the water, the second about 4 feet and the third about 3 feet. The head and neck combined to about 6 feet in length and Stuart also commented on their being a commotion in the water at about 15-20 feet behind the last hump which he surmised may be a powerful tail (adding these numbers up gives a total of about 50 feet). The skin was not hairy but was uniformly "blackish" in colour. The foot long head though sheep like had no discernible features and the neck thickened suddenly to join the first hump. Hay and Stuart were at variance as to whether the humps were fixed or some kind of undulation. And so the picture entered the lore and literature of Loch Ness. The picture was accepted as positive evidence by researchers such as Constance Whyte, Tim Dinsdale, Ted Holiday, Nicholas Witchell and Roy Mackal. In fact, Constance Whyte gives the fullest account and relates in her book "More Than a Legend" how she saw the picture on the same day it was taken and conducted interviews and onsite investigations within a few days. Tim Dinsdale goes into some detail in his "Loch Ness Monster" book but misspells Lachlan's surname as "Stewart". Holiday in his book "The Dragon and the Disc" uses the incident of Stuart's camera failing to take a second picture as an example of the paranormal "Loch Ness Hoodoo" but misplaces the event as happening in 1952. I don't think Ted Holiday's statement holds as Lachlan Stuart had stated that the camera had a pre-existing shutter problem. Maurice Burton in his 1961 book "The Elusive Monster" says that he visited the site of the photograph during his 1960 expedition and though predictably dismissive of the picture is vague as to the reasons why. But once the years rolled into the 1980s the mood changed and suspicion was cast upon the picture and it is one sceptical claim that this article will particularly examine. When I looked around for information on this photograph and googled for "lachlan stuart" and "loch ness", I found that eight out of the top ten hits dubbed the photograph a hoax because of a man called Richard Frere (above) who claimed to be privy to the hoax. There are other "evidences" for this photograph being faked which we shall examine in later posts but for now we look at Frere's claim. Richard Frere himself was most noted as working with and publishing a biography on the famous author Gavin Maxwell. Frere's other well known book was the 1988 "Loch Ness", a history of the loch and its surroundings as well as its most famous inhabitant. However, Frere was a Nessie sceptic, indeed an ardent one as his aforementioned book shows. He was also a keen supporter of preserving the beauty of the Highland countryside against commercialisation (as his opposition to the expansion of Urquhart Castle demonstrated). Needless to say, Nessie and Highland commercialisation went hand in hand adding more fuel to Frere's anti-Nessie stance. You can read more about Frere from his 1999 obituary in the London Times. However, when one looks into this particular story by Frere, it turns out there are four different versions of his account in the online and offline literature. They are listed in turn here. "Richard Frere, a well-known local author who died in 1999, actually watched Lachlan Stuart setting up his Loch Ness monster fake picture. It was three bales of hay covered with tarpaulin. When the Webmaster (i.e. Tony Harmsworth) published the fact that the picture was faked in his "Loch Ness - The Monster" publication, he received a poison-pen letter from one of Lachlan Stuart's friends ... which shows how well the photographer conned his friends. Recently his son called at the Loch Ness Centre and, surprisingly, he didn't know that his father had faked the picture either. It must be understood, however, that if you are going to produce a convincing hoax you must tell no-one the truth." "The remnants of this hoax were witnessed by local author Richard Frere. He spoke to Lachlan Stuart the next day, who confessed that he had constructed the image from hay bails and tarpaulin." This account implies Frere only saw the "remnants" which is an unclear term to me (e.g. perhaps he only saw part of the hoax being enacted or only saw the hay bales) and it seems Frere only got to the truth of the matter when he quizzed Stuart the next day. It seems Stuart failed miserably to follow Tony Harmsworth's advice to "tell no-one the truth"! "Lachlan Stuart takes a picture of three angular humps close to the beach. A little later, he confesses to a local resident, the author Richard Frere, that it was a hoax. Frere did not reveal the secret for thirty years." The implication here is that Frere was not at the site of the hoax being enacted but somehow he managed to get Lachlan Stuart to confess the deed. "A further photograph, published in the national press, was necessary if popular support for the story was to be retained. It came in 1951, a print of poor quality showing three black objects floating a few yards offshore. The picture was a deliberate deception, and a bad one at that. I have no particular objection to hoaxers, unless they endanger lives or waste taxpayers' money, and my chief reaction on getting first-hand knowledge of the affair was surprise at how easily even experts can be duped. This amateurish invention was given the seal of approval by a leading zoologist as the 'most important picture'." From this version from Frere's own mouth, we are left in an even more uncertain position as to how he gained this "first-hand knowledge" and the phrase itself could mean anything. It is interesting to note that in none of the above is the alleged head in the picture mentioned by Frere. So, which account is true? Did Frere see the whole thing (version one), or did he only see the discarded "props" and required a confession to complete the picture (version two)? Or was he never at the scene of the "crime" and was wholly dependent on confessions either directly (version three) or directly/indirectly as his own fourth and final account ambiguously states? Clearly something is not adding up here and if Lachlan Stuart was in the dock charged with deception, his lawyer would have no problem casting doubt upon the quality of the evidence against him. In fact, Tony Harmsworth's book lifts a bit of the veil on what is going on here when he recounts how Adrian Shine talked to him about Frere's account (page 82). Tony had his "version one" story but Adrian Shine had been told "version three" by Frere. How could these two stories be reconciled? My guess (though it is not primary to the overall problem) is that this conversation happened because the BBC had asked Adrian for this 75th anniversary summary of the Nessie evidence. Which version would he use for the article? The answer appears to be "both" or "neither" depending on your point of view as Adrian produced our second but conflated version for the BBC. By "conflated" we mean the critical device of conflation which involves the fusing of two variant texts into one with the intention to produce a new text which attempts to harmonise the variations in the originals. In other words, the second version of our four stories was not told by Frere but is an artificial construct which attempts to reconcile seemingly contradictory statements. Instead of these conflicting accounts from Frere setting off alarm bells, an attempt to harmonise was made instead. So in the light of these varying accounts, we could justifiably label Frere's stories as "unacceptable as evidence" and end this article. After all, if a witness to the Loch Ness Monster changed their story, the critics would be dismissive of it, n'est ce pas? But I wanted to dig a bit deeper before finally rejecting this evidence. The first thing that has to be said is that Richard Frere was not the "local" resident described above. In fact, he did not move to Loch Ness until 1959 - eight years after the photograph was taken! According to Frere's own autobiography "Beyond the Highland Line" (John Murray 1984), he was actually living in Carrbridge near Aviemore in a set of converted railway carriages. 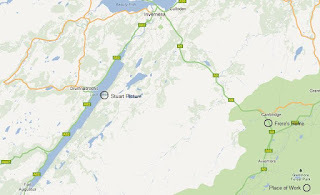 The map above shows its location relative to Loch Ness and the journey by road to the Lachlan Stuart location would be about 35 miles. Of course, this does not prove he did not pass by that spot in 1951 but it would make it less likely not only because he was not local but also because in 1951 petrol was still being rationed and Frere states in his book that he was so cash strapped that he could only run a motor cycle. On the subject of petrol, Frere also has a rogue side to his character freely confessed in his book. Since petrol was being rationed and thus limited peoples' movements, Frere indulged in the illegal activity of using paraffin to top up his motorcycle. It also transpires that he regularly defrauded his employers in two jobs by bunking off to go hillwalking or working on house renovations. One Loch Ness author suggested we should believe Frere's account over Stuart's because he was a "respected pillar of the community". What Frere would have made of such high praise we will never know. 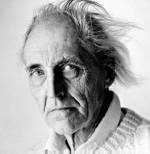 As it turns out, his autobiography gives us a neat rundown of his activities in 1951 and he reveals that he had a temporary Summer job from May with the Forestry Commission at the time of the Stuart incident. This is potentially significant because Lachlan Stuart also worked for them. However, Frere says that the job was a local one at Glenmore Lodge (about 5 miles SE of Carrbridge and marked on the map) and he makes no mention of working anywhere else. After that, he tried his hand at mushroom growing and poultry before setting up his own business in the mid 1950s as a timber cutter before he gave it up around 1960. It is possible that he knew of Lachlan Stuart through other employees, though it is unlikely he met and became Stuart's confidant due to his short tenure and large distance away. Certainly, Frere does not mention anything about Lachlan Stuart or his photograph anywhere in his book which is a strange omission given it is sandwiched between his conversation with Tony Harmsworth and his mention of it in his subsequent "Loch Ness" book. Certainly, his own autobiography offers no support for being familiar with Lachlan Stuart or Taylor Hay. Either way, it seems unlikely that if Stuart was a hoaxer he would blow his cover to someone he barely knew. In that light, if there is any grain of truth in what Frere says, it is more likely he merely heard someone indirectly saying that the photograph was faked or they thought it was faked which is hardly prime quality evidence. It is entirely possible the two men did meet as working colleagues but whether this was under good, neutral or bad circumstances is difficult to ascertain sixty years since the incident occurred. But, as you may rightly point out, Frere told Tony Harmsworth that he was actually driving past and witnessed the whole hoax being staged. Now I don't think that working for the Forestry Commission made this stumbling upon Lachlan Stuart any more or less likely. The reason I say that is because Constance Whyte's account says that part of Loch Ness was quite busy for forestry at that time which leads me to conclude any alleged hoaxing would have to be perpetrated on a non-working day as early or late as possible which would suggest Sunday morning or evening. I don't consider this a time that Richard Frere was highly likely to be far from Carrbridge. But it is a strange coincidence that a Forestry Commission worker chanced upon another one 35 miles away in the middle of perpetrating a Nessie hoax! In fact, too much of a coincidence in my opinion. The mystery for me deepened when I visited the site of the 1951 photograph a few months back. As I drove around the area and checked the beach itself, a big problem arose for Richard Frere. The first is that the beach is about 30 feet below the road. To access it, I parked on a lay by and then crossed about 40 feet of grassland before descending down a slippery slope to the beach (the lay by is pictured below from Google Street View plus my own photo of the obscured beach follows). There was some old stone steps at the bottom which suggested this area was once in more frequent use. I looked back up to where I had come from and I could not see the car from where I was. That meant the beach was not visible from the car which begs the question as to how Richard Frere could claim to Tony Harmsworth that he saw the men setting up the alleged hoax from the road? Giving the man the benefit of the doubt, I surmised perhaps he could have seen the beach from a distance approaching from the north or south. However, a drive up and down that area proved fruitless as the beach was simply not visible. These two pictures from Google StreetView show the problem. The first picture shows the loch view as we approach the Stuart site from the south. The layby of the first view is away up at the top right (as usual, click on image to enlarge). The second is from the approach from the north. In both cases, it is hard to believe that anyone could see the beach and its immediate waters from the road. Or perhaps the tree growth along that portion of Loch Ness was less in 1951 compared to the present day? I could accept that if a situation similar to 1933 had happened. Back then, a lot of shoreline was cleared to allow better views from the newly upgraded Glasgow to Inverness road. However, our road from Fort Augustus to Dores was not upgraded until the 1960s. In that light and since an ecosystem tends to reach an equilibrium with its resources fairly quickly, I suspect the shoreline of Whitefield in 1951 was not much different to 2012. However, the problems continued to mount. Tony Harmsworth's account from Frere says he was "driving" past the spot at Whitefield. However, people "drive" cars but "ride" motorbikes and Frere's autobiography is quite clear in stating he only owned a motorcycle called "Boanerges" at that time. Motorcycles also present further problems as they are a lot noisier than cars and can be heard approaching from much further away. However, Frere told Harmsworth that he approached and stopped to watch the whole hoax being enacted. Are we supposed to believe that Lachlan Stuart and Taylor Hay failed to hear this motorbike approach then stop and carried on regardless? More likely they would have aborted the operation and we would never have heard of this photograph at all. To put it simply, I doubt Richard Frere was a witness to an alleged hoax being perpetrated, let alone near Loch Ness that day. Neither do I believe Lachlan Stuart confessed anything to a stranger such as Richard Frere. The various and contradictory accounts force one to label this entire episode as unacceptable as evidence. One may speculate upon why these conflicting stories came to be but I will refrain from theories. It is sufficient to state the problems and move on. Sceptics may still accept Frere and make excuses but by their own standards the evidence is compromised and should be put aside. But having critically analysed this piece of testimony, I would need to point out I have not actually proven the photograph is genuine. 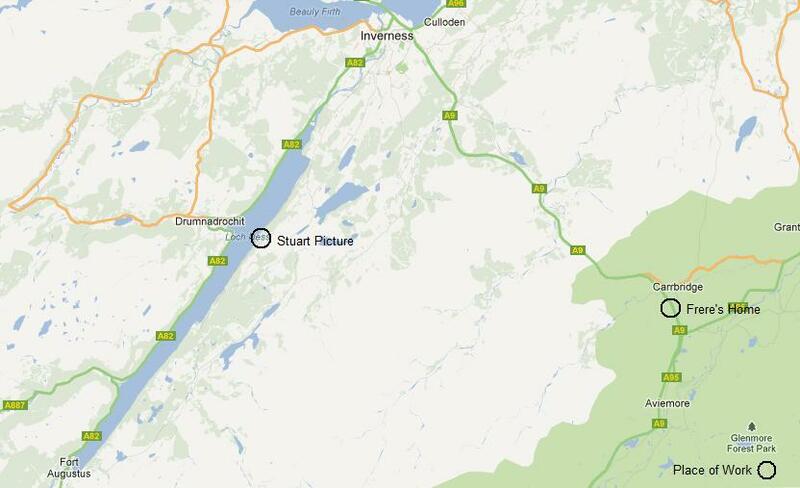 This blog approaches the mystery of Loch Ness from two directions. Defend the evidence for the monster where necessary is obvious, but removing objections to the creature or items of evidence presented against it is also important. The other aspect to this is demonstrating how poorly peer reviews of sceptical evidence is conducted. To put it more bluntly, it is not conducted at all as any critique which makes sense on the surface is accepted. It is the job of this blog to scratch that veneer of plausibility and expose the problems underneath. If sceptics of Lachlan Stuart's picture are seeking evidence against it, they will have to go somewhere other than Richard Frere. To that end, our next article on this picture will address more objections. Part Two can be viewed here.